The postcard for It’s Casual, an exhibition by five graduate students on view this fall in the RAFFMA Dutton Family Gallery at CSUSB, depicts a wrinkled restaurant napkin with the title written in pen. The image brings to mind a group of students sipping a beer while gathered around a table to collaborate or commiserate. At the entrance of the gallery the artists’ names were written in black Sharpie on the wall, marking their territory in a manner that set the laid-back tone of the show. Avoiding a formally hung group of stiff art work, the show consisted of unframed or unceremoniously hung paintings and photographs, a projected short film and mixed media pieces of paint and recycled objects. The work of Jenny Montenegro, a four painting series entitled The Witness, shows figures, ironically, with blocked-off vision. Are they kidnapped witnesses of a crime condemned to execution or are their blindfolds symbolic of the terror that comes with the etched memory of what they witnessed? Montenegro also included a five-minute video projected on the wall while a heartbeat continuously echoes from a speaker on the floor. It suggests to the viewer quite a different, more peaceful place than the Witness series. The artist sits on what appears to be a rooftop, peaceful in her cross-legged pose, city traffic and lights blaring in the background. The work calls to mind Kimsooja’s Needle Woman, a captivating video by the prominent Korean artist in which she stands still in the middle of a busy street, implicating the pedestrians in the performance as it is being documented. Montenegro’s film transports us to that rooftop, where we can join her in her passive pose. Both artworks speak to strength and serenity in the midst of chaos. Sapira Cheuk contributed two paintings composed of India Ink, acrylic and spray paints entitled Muscle and Hair. They reminded me of gilded versions of scientific cross-sectional anatomy. 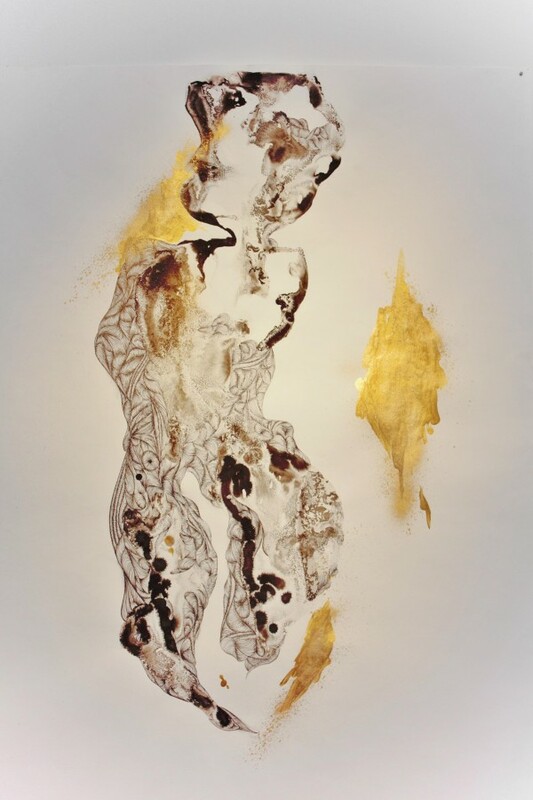 Cheuk’s detailed lines form intricate systems of muscles and the gold suggests royalty. 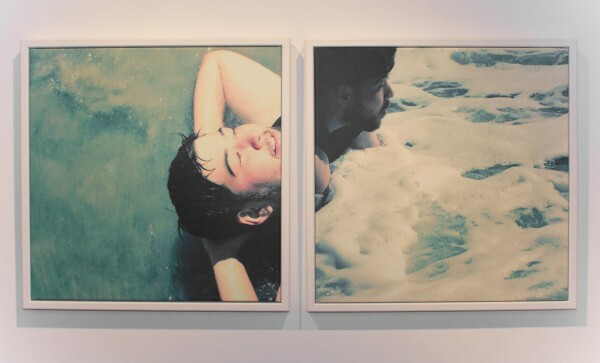 Matthew McMilon’s two sets of paired photographs of a man (or men) at the beach, offer another perspective on figuration. In the first, a man lies supine, the sun shining on his face, then dives into the frothy surf. The second shows a man stretching across a large rock, digging his toes into the cool sand, and into the bubbles of the water. Both Cheuk and McMilon explore the human form, whether it be complex structural compositions or lighthearted photographs of a man feeling a physical connection with nature. Nate Dubbs’ organically shaped glass creations serve as the centerpieces for three photograms placed around the room. 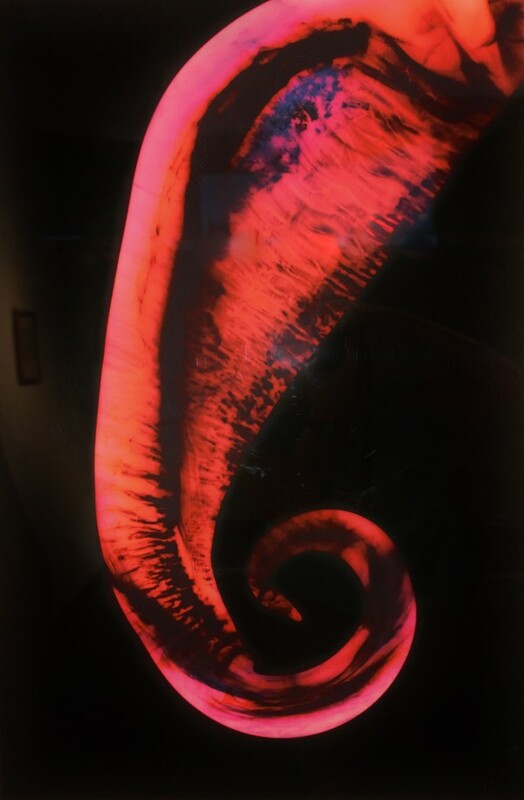 Culture resembles cell growth in a petri dish and Life Spiral an elephant’s tusk. The third one, entitled Bosons, had me checking Wikipedia, where I was able to confirm the biological references by discovering it is a type of particle in quantum mechanics. Dubbs’ use of vivid red and orange tones make them, by far, the most colorful pieces of the group. The artist’s mixture of corporeally shaped glass objects with a modern photography process successfully create an impressive visual experience. Two mixed media works by Bee Wilkie hang on the walls on either side of an exit door. The artist created a matrix barcode image that, when scanned, links the viewer to an Instagram of a selfie photoshopped into abstraction. He has placed the image loosely in a frame against an advertisement on which is written, “If it’s worth framing, frame it to last”. In an anarchic scrawl on the wall, he has written “Bee made this”, an authentication of ownership in lieu of his signature. His second work is a conglomeration of frames and painted, torn canvas pieces. 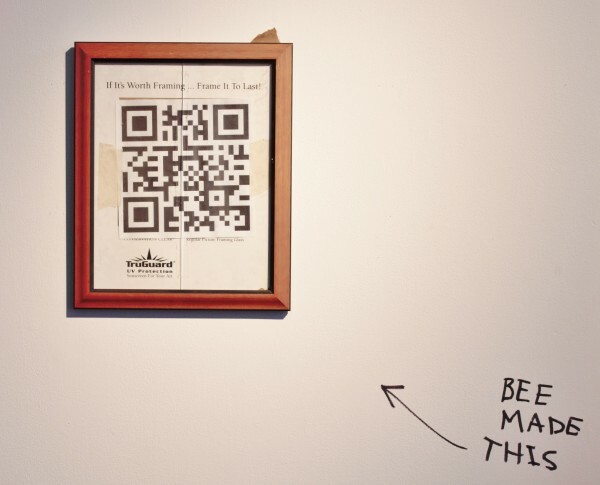 “And Bee made this too” marks the wall with an arrow pointing it directly out to the viewers. The artist reuses the leftovers of the art making process to pose the question of art versus non-art, making us all think about what we do and do not decide to frame. Perhaps Marcel Duchamp’s R. Mutt, which served as an irreverent challenge to the Salon, influenced Bee’s thought-provoking works. The five artists effectively organized an eclectic collection of work made during their second year of graduate studies. As evidenced by the title they agreed on, they intended it to be “casual”. As is usually true with art that first appears informal, looking more closely at the individual works bring more serious thoughts to mind. Montenegro says “Art is a projection of the artist’s emotions and the world as they see it.” No doubt, serious issues like body image, the environment, scientific advancement, the ontology of art, and surviving in today’s tumultuous world are important to these artists. In my opinion, It’s Casual proved to be a successful reflection of the individual artistic voices of five graduate students that feel compelled to make art about the world from their viewpoint.